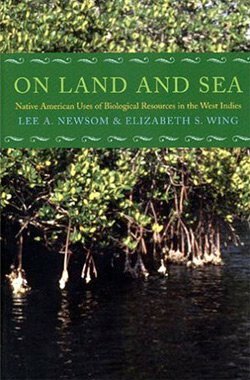 Lee Newsom studied native American use of plants in prehistoric West Indies (1993 University of Florida Dissertation). Lee Newsom and Elizabeth Wing are integrating the data with information on the plant and animal uses in the West Indies. This also relates to research being conducted by Charles Woods on the biogeography of the West Indies. During the vast stretches of early geologic time, the islands of the Caribbean archipelago separated from continental land masses, rose and sank many times, merged with and broke from other land masses, and then by the mid-Cenozoic period settled into the current pattern known today. By the time Native Americans arrived, the islands had developed complex, stable ecosystems. The actions these first colonists took on the landscape-timber clearing, cultivation, animal hunting and domestication, fishing and exploitation of reef species-affected fragile land and sea biotic communities in both beneficial and harmful ways. On Land and Sea examines the condition of biosystems on Caribbean islands at the time of colonization, human interactions with those systems through time, and the current state of biological resources in the West Indies. Drawing on a massive data set collected from long-term archaeological research, the study reconstructs past lifeways on these small tropical islands. The work presents a wide range of information, including types of fuel and construction timber used by inhabitants, cooking techniques for various shellfish, availability and use of medicinal and ritual plants, the effects on native plants and animals of cultivation and domestication, and diet and nutrition of native populations.